Minteroos. Like Scotcheroos, but minty. I've been obsessing on this recipe for a couple of days. Not because I have nothing else to do. I mean, I'm now waking up at 5:00 A.M. every morning now that my son is in middle school, and it's been super busy these first two weeks of school with all of us being in education in one form or another, but I've been obsessing about this nonetheless. I love Scotcheroos, and I need to post a recipe for those soon, but for some reason I felt like trying something a little different. 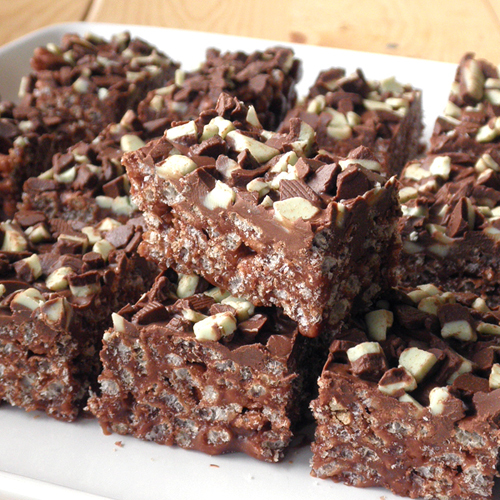 I like chocolate and mint together, so this seemed like a natural bar cookie. I wasn't sure how to execute this idea, since peanut butter is a major player in the Scotcheroo base. I decided to go with Nutella instead, since it's mostly chocolately and slightly nutty; and I happened to have a little bit left in my cupboard. I have been pleasantly surprised by the results: crispy, sweet, chocolatey and minty, but not too minty. Unlike some of my experiments, I actually want to keep eating these. Now I just need to find some people to give them away to so I don't eat them all. Lightly butter a square baking pan with the 1/2 teaspoon butter. In a heavy saucepan over medium heat, bring sugar and corn syrup to a boil. Remove from heat and with a rubber spatula stir in Nutella until completely mixed. Fold Cocoa Krispies in until completely coated with the sugar mixture. Pour into prepared pan and with buttered fingers, press into pan. Don't crush the cereal, but press in firmly. Spread melted chocolates onto the Krispies in the pan. It will be a pretty thin layer, so you may have to work at spreading it evenly. Sprinkle remaining 1/4 cup Andes chips evenly over the top. Allow to cool completely until chocolate has firmed up before cutting. Cut into 24 small bars, or 12 medium sized bars. Store in an airtight container, or cover pan with plastic wrap.